Delicious organic cashew nuts not only boast a rich, creamy flavour, they’re also packed with a selection of highly beneficial nutrients including minerals (such as potassium, calcium, sodium, magnesium, iron, copper, zinc and phosphorus), vegetable protein, omega 3 fatty acids, almost every essential amino acid and powerful antioxidants. Cashew nuts can be enjoyed straight from the bag as a particularly wholesome snack between meals, or mixed with other nuts and dried fruits of your choice to prepare a tempting trail mix. This refreshingly fruity rawfood salad can be rustled up in next to no time, leaving you free to enjoy the last of that summer sun. 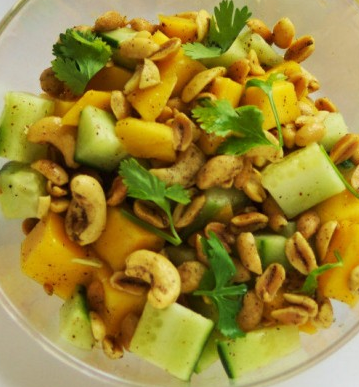 First, peel and dice the mango, rinse and slice the apple and add both ingredients to a large salad bowl. If you’re unable to source fresh mango, then use a generous handful of organic dried mango instead. Next, add in the balsamic vinegar, cinnamon and ginger and season with a dash of Himalayan pink salt. 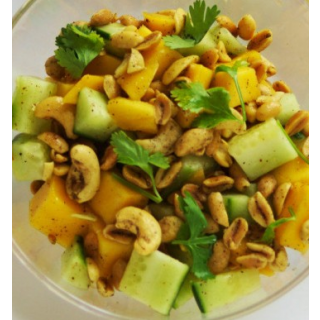 Finally, top your salad with crunchy organic cashew nuts and toss gently before serving. Who said salads were boring? !